behind much of the Buckeye State’s success. hio has reclaimed the Governor's Cup from rival Texas for new and expanded project activity. The Buckeye State's 498 qualified projects for 2011 represents a better-than-30-percent jump from its 376 projects logged in 2010, which put Ohio behind Texas in the last contest. Texas finished second this time around with 464 projects (a 40-project jump from the previous year), followed by Pennsylvania (453), North Carolina (310) and Virginia (273). All five top states, and many others, recorded substantial increases in new plant activity for 2011, reflecting keen interest on the part of capital investors to get busy with expansion plans in general and, in many cases, to move operations back to the U.S. in light of decreasing labor cost benefits associated with offshore strategies and heightened logistics costs related to non-U.S. operations. 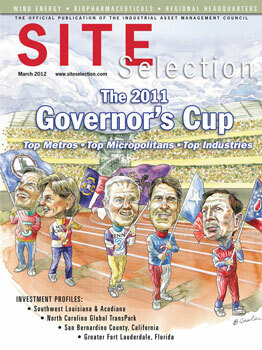 Site Selection's Governor's Cup ranks the 50 states according to their success in attracting capital investment projects that meet one or more of these three criteria: a minimum investment of US$1 million, creation of 50 or more new jobs and new facility construction or floor space of at least 20,000 sq. ft. (1,860 sq. m.). The magazine does not count equipment upgrades or additions nor construction jobs in its final numbers. What's behind Ohio's comeback? It could be Gov. John Kasich's efforts to make the state more business friendly. Much of that means running the state more like a business, a strategy that resonates with businesses wanting a Midwest location and the logistics advantages inherent in such a location. A new economic development strategy also plays a role, with much of the Ohio Department of Development's new-business-attraction efforts now resident in a unit called JobsOhio. "From 2006 to 2010, Ohio lost 400,000 jobs, so Gov. Kasich wanted to recast the Department of Development and make it a public-private partnership and privatize the development function into the creation of JobsOhio," says Mark Kvamme, president of the new entity. The board of directors includes CEOs and other senior executives from such Ohio corporate icons as Procter & Gamble, Marathon Oil, the Cleveland Clinic and others focused since July 2011 on development initiatives. JobsOhio is funding itself from state liquor-related revenues that will result in a pool of upwards of $100 million annually with which to devote to economic development initiatives. "Jobs are the number one priority of the new governor," says Kvamme. "We were the number one job creator in the Midwest in 2011 and number nine in the United States. In 2010, we were 47th in job creation in the United States. The governor built the Cabinet and development group that was solely focused on job creation — that was the main factor. "Second, we created a methodology and a team of people that had worked with businesses before," says Kvamme, noting that his background is venture capital, not economic development. "The governor asked me to run economic development and [stipulated] that he would pay me a salary of $1, with the expectation that I would build a team of accomplished business and economic development people focused on job growth in Ohio." But state government does not create jobs, he maintains. In fact, it's very good at impeding job growth. Rules were in place, for example, that regulated interstate truckload weight limits allowing trucks from Michigan to carry heavier loads into Ohio than trucks could carry exiting the state. The regulation nearly cost Ohio a major project that wanted to locate in northern Ohio and carry equally heavy loads into Michigan. "Were the roads stronger on one side of the border than the other?" Kvamme says he asked. "It didn't make any sense." So he called the head of the transportation department — who was meeting with the governor at the time — to discuss the issue. "It is understood that you can take anyone out of any meeting to discuss matters of economic development. Ninety minutes later, the problem was solved — we could now do Michigan loads both ways. That resulted in the company Menards staying and adding 350 new jobs in Ohio and $50 million in a new distribution facility. I can give you 30, 40 — 50 examples like that. That's what it's about — focus and a cabinet focused on this. We've been able to work with our big manufacturers and get rid of some of these regulations that make no sense." Ford Motor Co. is closing a facility in Mexico and moving those operations to Avon Lake, Ohio, for example, investing $1 billion in the state. "A year ago, they told us they had no intention of investing in Ohio any more because of the regulations and methodologies and so forth," says Kvamme. "Working with these companies to understand what they can and cannot do has really created an environment that is quite unique." The second bill signed by Gov. Kasich, after the one creating JobsOhio, was the one establishing the the Common Sense Initiative (CSI), helping businesses communicate the issues that prevented them from succeeding. A soup manufacturer, for example, was prevented from buying bulk quantities of wine for use in soup making. It had to buy individual bottles for mass production, the initiative revealed. "It's about creating a business-friendly environment," Kvamme asserts. "At the end of the day, businesses compete worldwide, and if they are not efficient here in Ohio or in the United States, they will not be successful. We have to do everything we can to create an efficient environment for them." Ohio does not intend to miss the reshoring trend as businesses move operations back to the U.S.
"Logistics costs are now higher than labor," says Kvamme. "That's even more the case with high-tech manufacturing. We're working with these companies to figure out how they can reshore more of these capabilities, and we believe Ohio is perfectly placed for that. We have some of the most efficient logistics capabilities in the United States." Sixty percent of the U.S. population is within 600 miles (965 km.) — a one-day drive — and 60-plus percent of manufacturing is within the same perimeter, he notes, adding that the state's river and lake transport system is well poised to meet the logistics requirements of companies looking to reshore operations. An ROI (return on investment) calculator is now used to determine whether an incentives package is good for Ohio in terms of job creation and taxes received, says Kvamme. "I'm happy to say that over 90 percent of the deals we did last year were ROI-positive to the state, which means the state received more taxes than tax incentives given. These are direct taxes from the corporation, not multipliers that the economic development guys like to do. Over a 10-year period, it's multiple billions. "I said I only wanted to be measured on three things — net new jobs created on things we work on; new capital investment, because if companies invest capital in the state they'll stay in the state; and third is ROI. Net new jobs created or retained is about 81,000 jobs, new investment is around $3 billion, and ROI to the state is about $200 million. If you don't have metrics, you don't know how well you're doing and can't make quick decisions. Our companies working with us are competing worldwide and in real time. We needed to create a development capability that does the same thing." he first bill Governor John Kasich signed into law, in February 2011, created JobsOhio, a non-profit corporation that replaces Ohio’s government-driven job-creation efforts with a new, private-sector approach. Joining Kasich at the Statehouse bill-signing ceremony were Lt. Gov. Mary Taylor, Senate President Tom Niehaus (R-New Richmond), Speaker William Batchelder (R-Medina), bill sponsor Rep. Mike Duffey (R-Worthington), Sen. Chris Widener (R-Springfield), Sen. Keith Faber (R-Celina), Department of Development Director Mark Kvamme, and business leaders from across the state.